I made these mini quiche for the first time for Eli's baptism party last fall. Church started at 9am and we were heading back to our house immediately afterwards to start a celebratory brunch. Everything I made had to be prepared ahead of time and ready to pop in the oven as soon as we got home. These mini quiche were absolutely perfect for those requirements. I was able to make, bake and freeze them ahead of time, and just pop them in the oven from the freezer. On top of that, they were delicious and made the whole kitchen smell amazing! I keep a few in the freezer for a quick breakfast, made some for Thanksgiving, and will be making them for an engagement brunch I am hosting next weekend. In other words, they are the perfect party addition. Preheat oven to 450 degrees. Put the cornstarch in a medium bowl. Whisking steadily, slowly pour in 1/2 cup of the milk, mixing until quite smooth. Whisk in the whole eggs and egg yolks, mixing again until smooth. Gradually whisk in the rest of the milk, the cream, salt, and nutmeg. Use immediately or refrigerate, covered, for up to one day. If using the next day, be sure to re-whisk. In a nonstick pan, heat oil over medium heat. Add garlic and shallots and stir until fragrant, about 2 minutes. Add grated zucchini, and stir until just softened, another 3-4 minutes. Remove from heat. Oil mini muffin tins well. 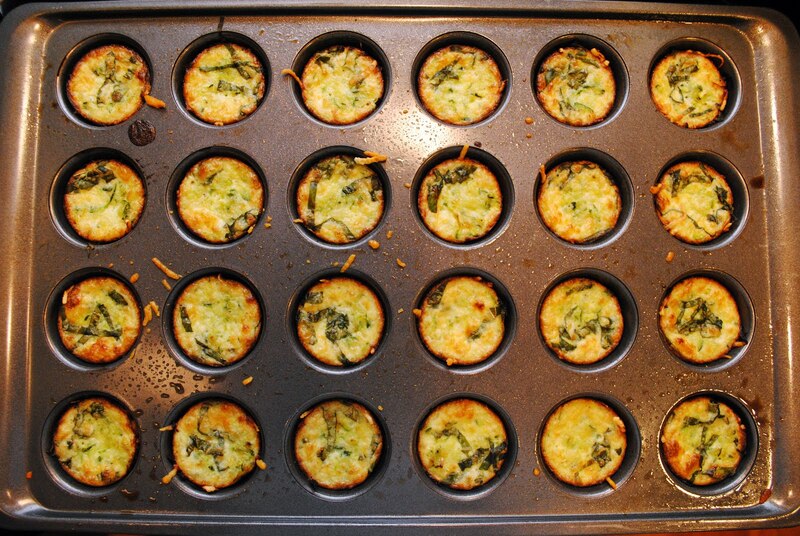 Put a pinch grated cheese into each muffin cup, a teaspoon of zucchini mixture, and pinch of chopped fresh basil. Pour 1 tablespoon of the batter into each muffin cup. 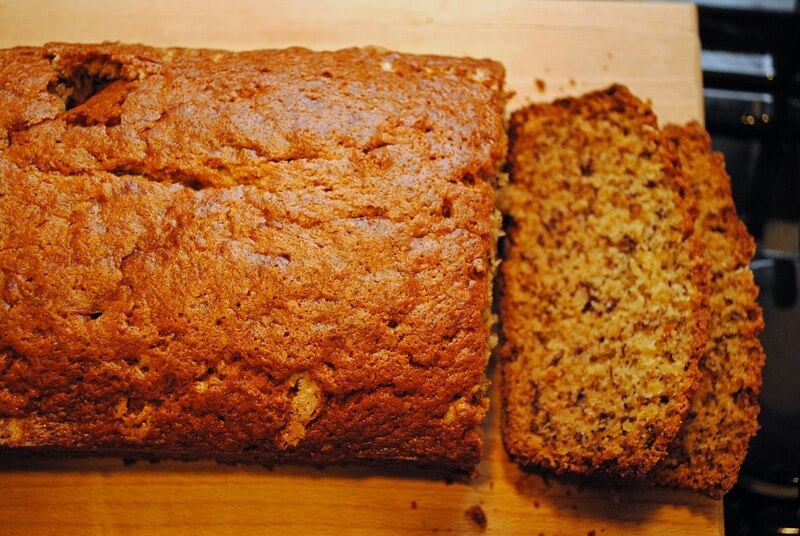 If freezing, let cool, then flash freeze in a single layer on a baking sheet for 30 minutes. After this time, place quiches in a covered container. Reheat on a cookie sheet in a 400 degree oven for about 5-10 minutes. Preheat the oven to 250 F. Meanwhile, to make the caramel, melt the butter in a 2-quart saucepan set over medium heat. Once the butter is melted, mix in the corn syrup, brown sugar and salt. Increase the heat to medium-high and bring the mixture to a boil, stirring frequently. Once the mixture reaches a boil, let the mixture continue to boil for 5 more minutes without stirring. Remove the mixture from the heat, stir in the baking soda and vanilla extract. The mixture will bubble up and become frothy. 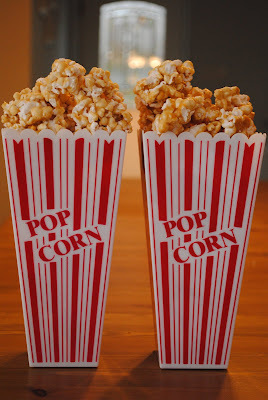 Pour the caramel sauce over the popcorn in the bowl(s) and toss to coat thoroughly. 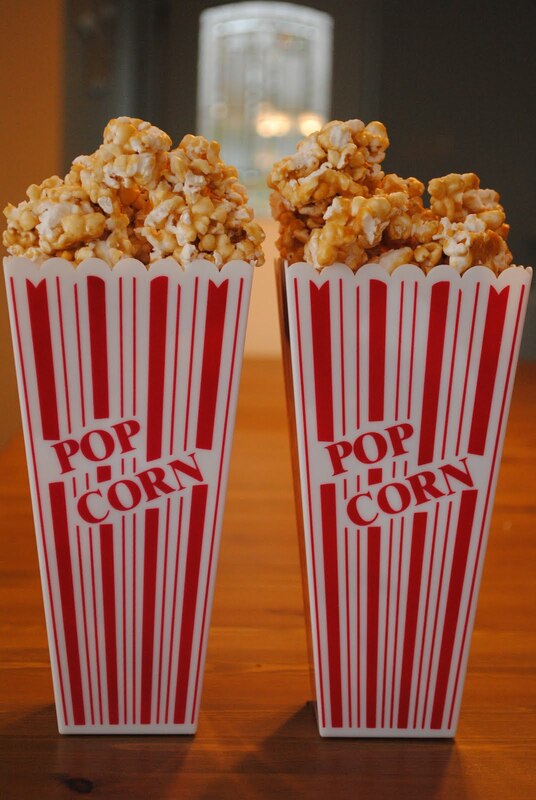 Spread the popcorn evenly onto two large baking sheets lined with parchment paper. (It is okay if there are some clumps of caramel throughout. It will melt and become better spread out while baking.) 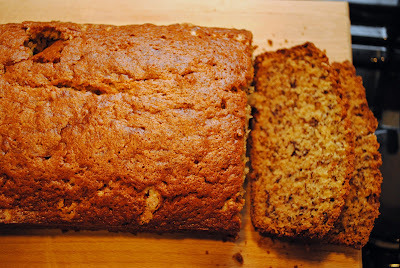 Bake for 45-55 minutes, removing from the oven to toss/stir every 10 minutes. After 45 minutes, test a cooled piece of popcorn. If it is not completely crispy (i.e. still slightly mushy when you bite it), bake for 10 minutes more. Remove the baking sheets to a wire rack and allow popcorn to cool completely before breaking apart for serving or packaging. If you are trying to be good this holiday season, then I recommend you close your browser this instant! 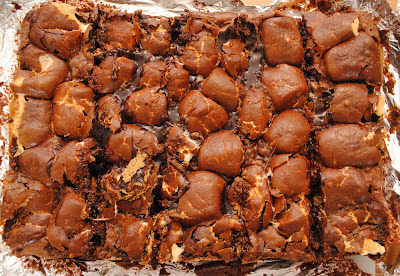 A layer of brownies, then gooey, toasted s'mores, then another layer of brownies. You bet I want some more! This recipe is so easy, and would be great in any season. (I made the brownies from scratch, but you could be even easier if you use brownie mix. Don't worry, I won't tell.) Just be prepared to wear your stretchy pants. I recommend not cutting these until they have rested overnight. The above picture was taken before I cut into them, which was just a big gooey mess since I had only waited an hour. Oh well, they still tasted just as good. :) Enjoy! Preheat oven to 350 degrees. Prepare brownies according to recipe. Line foil into a 13x9 inch baking pan and spray generously with cooking spray. Pour half the brownie batter into lined pan. Layer graham crackers over brownies, followed by Hershey Bars and marshmallows. 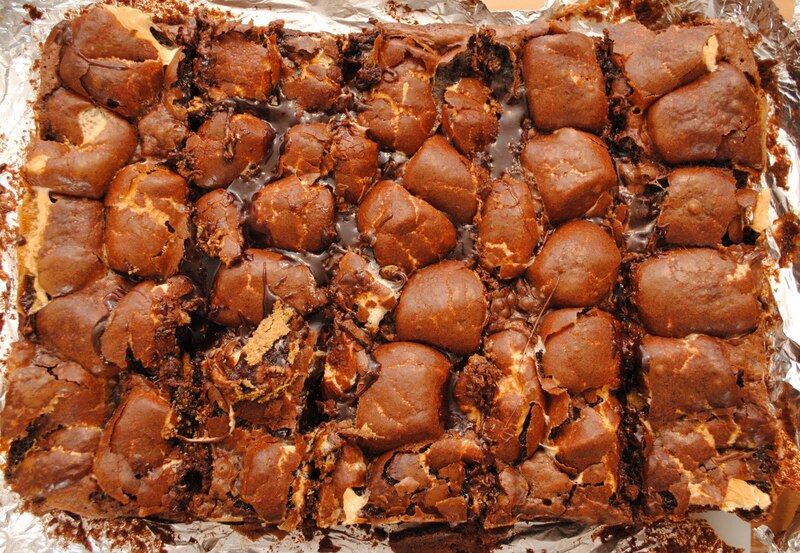 Pour remaining brownie batter over marshmallows. Bake for 45-55 minutes or until toothpick comes mostly clean from center. Remove from oven and let cool in pan overnight. Carefully remove foil and brownies from pan. Peel any foil from away from edges and cut into squares. Hello, there! I hope everyone had a wonderful thanksgiving full of family and mashed potatoes thankfulness. Justin's mom sent us home with enough turkey to feed an army us for weeks, so I whipped up this chili as a new take on the turkey leftovers. Never mind that it is supposed to be 70 today.... (does anybody feel like it's hard to get in the spirit with this spring-like weather?) 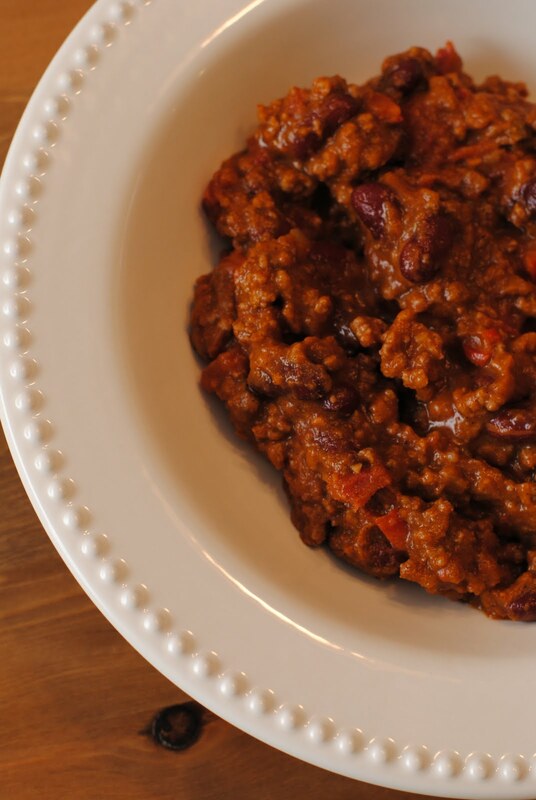 This chili was a great way to use up those t-day leftovers! Heat oil in a large skillet or Dutch oven over medium-high heat. Saute the onion, green bell pepper, jalapeno pepper, and garlic until tender, about 10 minutes. Stir in turkey, tomatoes, beans, and pumpkin. Season with chili powder, cumin, pepper, salt, and cayenne. Reduce heat and simmer at least 20 minutes. Stir in fresh cilantro (if using). Serve topped with Cheddar cheese and sour cream. I can't believe it's the week of Thanksgiving! I don't know where this year has gone. My grandmother used to make this dressing every year when I was growing up in California. The smell of the sweet cornbread and savory vegetables on the stove brings me back to my elementary school years when I would "help" her make this. (aka I would crumble the cornbread while she did everything else). When I was in high school, she had me help more and more until I was making the dressing and she was just sitting back to supervise my effort. My Nana has been gone for many years, but I still make this every year, just so I can remember the times when I would be in her pastel pink kitchen, on my too-tall step stool, asking if it was time to crumble yet. 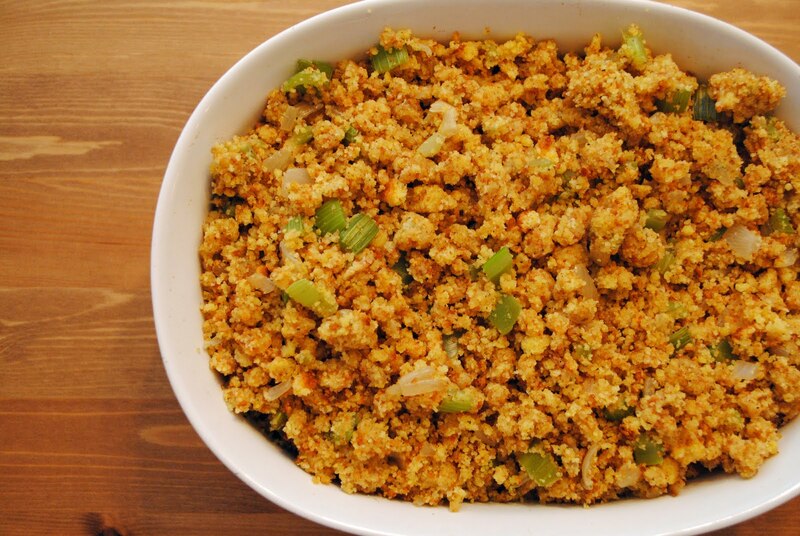 If you are short on time, this is a great dressing for your Thanksgiving feast! Bake cornbread, and let cool. Crumble and let sit for several hours or overnight. Preheat oven to 350 degrees. Heat butter in a nonstick skillet over medium heat, and add onions and celery. Saute until onions are clear and celery is soft. Meanwhile, boil two cups of water. Add chicken bullion cubes and let dissolve. Remove from heat. Add 1/2 Tbsp poultry seasoning to the onions and celery, and mix well. Stir in cornbread. Add salt and pepper, and more poultry seasoning to your tastes. Add one cup chicken bullion to cornbread mix, and stir well. Continue softening cornbread with chicken bullion until it is moist (but not mushy). Remove from heat and stir in pecans, if using. Transfer to a 9x9 baking dish and cover with foil Bake for 30 minutes, or until heated through. 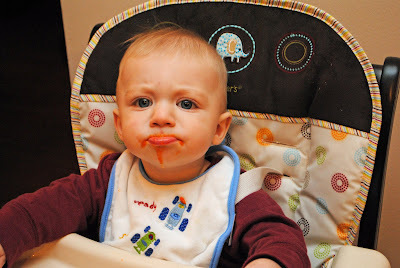 Contrary to this face, he actually loved carrots! 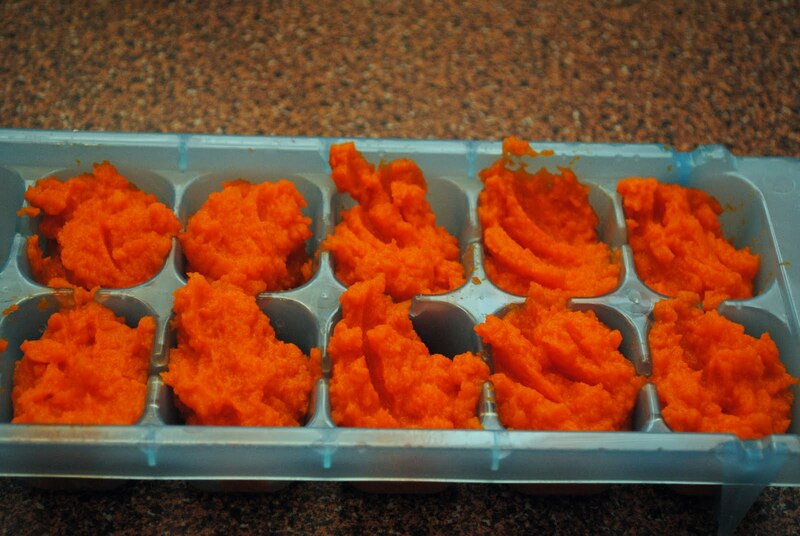 Like most baby food, it didn't require a huge amount of work. Steam, puree, freeze. That's pretty much it! Carrots are a great solid for babies. They are easy to digest and are packed full of nutrients such as Vitamin A, Vitamin C and Calcium, and Beta Carotene. Due to the issue of Nitrates, recommendations for the introduction of carrots varies. Please see this article on Nitrates for more information before preparing carrots for your baby. Place into your choice of appliance for pureeing and begin pureeing. Add water as necessary to achieve a smooth, thin consistency. 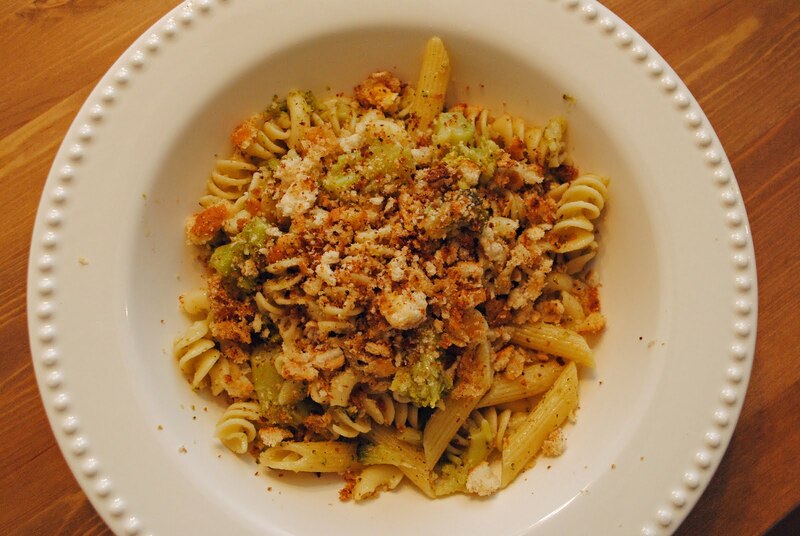 Some variation of pasta with broccoli is usually our fall-back meal. You know, the meal you make when you a) are missing an ingredient for the meal you had planned to make, b) you are tired after a long day of work, or c) don't feel like cooking and it's this or calling the neighborhood pizza place. I am a creature of habit and could eat the same thing every day, but Justin likes a little variety. When I saw this recipe, I was intrigued by slow-cooking the broccoli, as well as putting breadcrumbs on pasta. I didn't think I would like the crunchiness on top, but it is now my new favorite pasta topper. The rough texture and crunchiness is the perfect compliment to the soft pasta. While this isn't exactly in the "just as fast as ordering pizza" category, it's just as easy and you won't feel guilty for having dessert afterwards! Break down your broccoli as follows: cut the thick stems from the florets, peel and cut them into 1-inch chunks. Break the florets into pieces. If the garlic cloves are small (the size of an almond) leave them whole. Cut larger cloves into halves or quarters. Pour 1/3 cup of olive oil into a large stock pot or dutch oven. Add the broccoli, garlic and a pinch of salt. Add about 2 or 3 Tbsp. of water and put on the lid. Place over a medium low flame and cook until you can hear the liquids starting to simmer (about 10 minutes.) (It's fine to peek in the pot to see how things are going.) Turn the flame down as low as possible and continue cooking until the broccoli is limp and completely soft, about another hour. Turn off the heat but keep the lid on your pot. In a large frying pan, heat up the oil and butter and add the breadcrumbs (and optional red pepper flakes) and sauté until the crumbs begin to brown. Add a small pinch of the salt and turn off the heat. Using a microplane or a fine grater, carefully grate just the peel from the lemon and toss in with the crumbs. Meanwhile, cook pasta in salted boiling water according to package direction until al dente. Drain and set aside. Remove the broccoli from the pan with tongs until the only thing left in the pot are the cooking liquid and the garlic cloves (which will be quite soft.) Smash the cloves against the sides of the pot and mix them into the liquid and pour it over the broccoli. Toss the pasta, the broccoli and juices together and sprinkle on the breadcrumbs. This time of year, I get two common requests: Pumpkin Chocolate Chip cookies and Snickerdoodles. When I saw this recipe in my google reader, I knew it would be a winner this holiday season. We had multiple Halloween parties this past weekend, so I whipped up a double batch of these cookies and they surely did not disappoint. 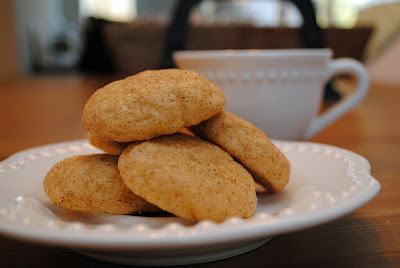 Try these for the Snickerdoodle lovers in your life. They will love them! Preheat the oven to 350 degrees, and line baking sheets with silicone baking mats or parchment paper. Combine the sugar and spices for the coating in a bowl and mix to blend. Scoop the dough (about 2½ tablespoons) and roll into a ball. Coat the dough ball in the sugar-spice mixture and place on the prepared baking sheet. Repeat with the remaining dough to fill the sheets, spacing the dough balls 2-3 inches apart. Dip the bottom of a flat, heavy-bottomed drinking glass in water, then in the sugar-spice mixture, and use the bottom to flatten the dough balls slightly. Recoat the bottom of the glass in the sugar-spice mixture as needed. Bake the cookies for 10-12 minutes, or until just set and baked through. Let cool on the baking sheets about 5 minutes, then transfer to a wire rack to cool completely. Repeat with the remaining dough. Store in an airtight container.